This light, tasty recipe is a perfect summer starter. Although fava beans are generally early spring vegetables, I have been seeing them in our stores during the summer months. You could substitute any other fresh, summer vegetable, such as asparagus or zucchini if you cannot find fresh fava beans. Shell the fava beans, discarding the pods. Cook in boiling water until tender. Drain and place in an ice water bath. Prepare the green beans in the same manner, set aside. Poach the shrimp in boiling water for 2 minutes, remove. Remove the tops from the fennel, as well as any brown outside pieces. Slice thinly lengthwise. Place in a large pan with the white wine, lemon, chicken broth, and enough water to barely cover. Bring to a boil, then reduce the heat and simmer until tender, about 15 minutes. Set aside. Make the sauce adding all the ingredients into a blender and pulse. 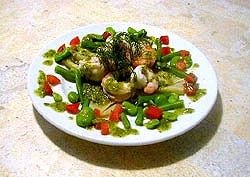 On each of four plates, arrange first the fennel slices, then the shrimp, and beans in an attractive manner. Scatter the diced tomato around the plates and then drizzle each plate with some of the dressing. Decorate with some fennel fronds, and serve.